It was a simple idea: create a device that enabled premium and ad-supported online video content to be shuttled from a PC to TV, without the need for a home network. That was the promise of SanDisk’s TakeTV device and accompanying video download service Fanfare, which, reports NewTeeVee, was shut down on May 15th. The official party line is that TakeTV was no longer a priority for SanDisk as the company focuses on being at the hub of mobile entertainment. Translation: No one bought the device. It’s easy to understand why; SanDisk was outgunned and outnumbered on this set-top bet. NewTeeVee’s Chris Albrecht offers up a number of reasons why Sandisk’s offering didn’t resonate with consumers, namely that the overall solution was kludgey: “You had to plug a USB device into your PC, download content, then put that USB device into another device that hooked up to your TV”. There was also a lack of compelling content available through Fanfare, and the service faced huge competition from Apple, Sony, Microsoft, TiVo etc., not to mention various IPTV offerings from incumbent Telcos. 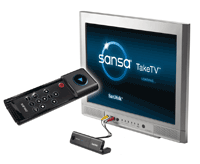 However, where we thought that the TakeTV device itself had some merit was in its ability to playback DivX and Xvid video, coupled with the non-technical approach that SanDisk had taken to shuttling content around the home. As David Poltrack, president of CBS Vision, told Business Week at the time of launch, “when we tested the SanDisk product it clearly resonated with consumers… There are other ways to do this with more sophisticated products, but because of cost and complexity they’re not as attractive. This is going to be selling at Wal-Mart.” Although he probably wasn’t thinking of DivX support specifically 🙂 And sell at Wal-Mart it obviously hasn’t. Our advice to those who want to watch DivX content on the TV, without going down the home network ‘media extender’ route, is to purchase one of the many DivX ‘certified’ DVD players on the market, especially one with a USB slot that can read from a thumb drive and therefore replicate much of the functionality of TakeTV. I worked on an early version of this product and still have – and use – a pre-Alpha version at home. It easily lets me watch downloaded TV on my big screen, sted the mac monitor. What you didn’t mention was that SanDisk had hoped to cut deals with TV manufacturers to get their USB slot built in. That would have avoided a lot of the kludginess and extra steps. That apparently never happened. Too bad! I will continue to use my raw device – held together by black electrical tape and showing all of its interior circuitry, as the devices you talk about are hard to find and use where I live. Interesting inside view. I didn’t know about the planned deals with TV manufacturers. Shame it never happened. Yup, I bought this as a birthday gift for a friend. It’s a cool concept, but there were definitely some hardware/software shortcomings. It actually works surprisingly well on a Mac, and is cheaper than other solutions. But still, I can’t say I’m completely surprised. . .